Three layers of chocolate cake with a chocolate filling, a chocolate-flavored whipped cream and a chocolate ganache topping. It was good, but not as good as the white chocolate raspberry torte from Wednesday. The non-pariel covered truffle was good. I ate that last. I decided to take some things home with me. Cookies. 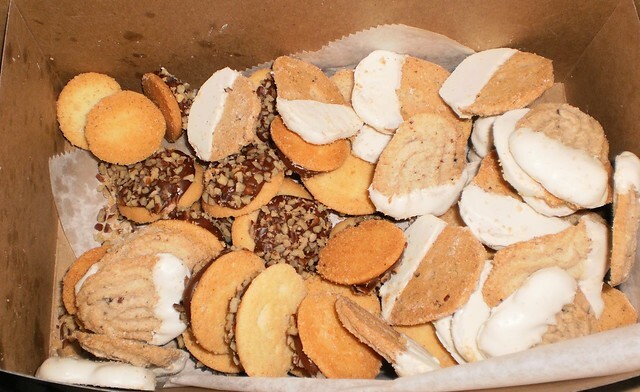 A pound of Austrian butter cookies. The ones with the white tips are white chocolate. The ones with the chocolate circles on them are listed as caramel peanut butter. They would be better described as chocolate peanut butter. The caramel flavor was just barely hinted. I should mention this excursion was last Friday, March 11. I figured I'd have the cookies for raiding over the weekend. They were incredibly good and oh, so rich. I ate about 10 of them on Friday night and could not eat any more. There's a good 2 dozen of these in the box. I finished the last of them Monday after work. Oh my. I am very glad this bakery isn't within my easy driving distance. The best thing I brought home, however, was a loaf of bread. 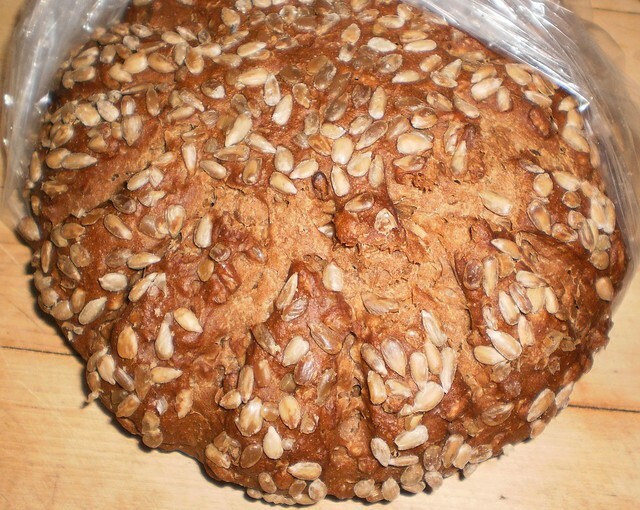 This is sunflower bread. Not only is the top studded with sunflowers but there must have been at least 2 cups of seeds throughout the bread. I probably should have had him slice it for me. I opted to do it myself and either I'm very weak or my bread knife is in dire need of sharpening because it was just hard to slice off a chunk. But I was reminded by a friend that this isn't a mass produced mound of dough and, as such, it's not meant to be slice thin enough for the toaster. It wouldn't have fit anyway, given the size. 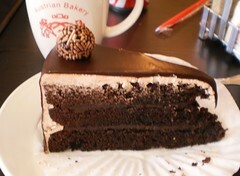 And it made me sad that this bakery isn't within easy driving distance. Maybe it's not true, but I think this is healthier than the stuff I buy off the shelf at Dominicks. No way can I stuff a piece of ham and a slice of cheese between two pieces of this but I wasn't eating it in a sandwich. I warmed it with a little butter and jam and that was phenomenal. It would probably cost $10 if I found it in the mainstream grocery. In this little bakery on Clark Street, it was $4.95. I finished the loaf Tuesday evening and now am thinking I need to give Jon $5 when he heads down there again with orders to bring back a loaf of something.